Maureen Burke has lived with celiac disease for 25 years — long enough to know exactly what she doesn’t want in her food. Gluten is a given. But now another ingredient has made Burke’s do-not-eat list: genetically modified organisms, or GMOs. GMOs are plants that have been genetically altered to make them more resistant to pests, viruses and drought, and to improve their shelf life and nutritional value. But there is passionate debate about the safety and risks of GMOs. Burke, of Crofton, Md., says she suspects that something in the environment or food supply explains the explosion of celiac disease, food allergies and related autoimmune problems. She’s decided to avoid GMOs until their potential impact on people has been sufficiently studied. At the same time, consumer demand for products that do not contain GMOs has swelled. The Non-GMO Project, which offers North America’s only third-party verification and labeling of non- GMO products, reached $3.5 billion in annual sales in 2013, just three years after the label’s launch. In a recent Gluten-Free Living poll, a large majority of readers called GMOs an “important” issue. People who prefer foods that are both gluten free and non-GMO often cite a desire to eat as “cleanly” as possible and a belief that environmental factors contribute to increased cases of celiac disease. People who want to buy gluten-free, non-GMO foods face several challenges. GMOs are prevalent in many gluten-free foods, especially those that are corn-based. Foods that are both gluten- and GMO-free can be difficult to find, not to mention costly. But Burke and others say avoiding GMOs is worth any extra effort and expense. Gluten-free consumers’ natural curiosity about food labels and ingredients apparently extends to GMOs. Gluten-Free Living recently asked its website visitors: When you buy gluten-free products, how important is it they also contain ingredients that are non-genetically modified organisms (non-GMO)? Nearly half — 47 percent — said it was “very important” and that they only buy non-GMO gluten-free products. Another 36 percent said it was “somewhat important,” and they buy non-GMO gluten-free products when possible. Just 17 percent said it wasn’t important, and they don’t pay attention to whether gluten-free products are non-GMO. A celiac disease or gluten sensitivity diagnosis often leads to a renewed focus on overall health. Many patients, especially those with related health problems, might question how environmental factors affect them, including GMOs. How GMOs affect people and animals remains a hotly contested area. Those on both sides of the debate point to research studies that support their positions on the safety of GMOs. “The truth is that GMOs today are so prevalent, contamination is so prevalent, oftentimes there is a lot of contamination of GMOs in organic food,” Kinsman says, such as “drift” from GMO plants grown nearby. The Non-GMO Project, on the other hand, tracks the entire supply chain of products, which should give consumers more peace of mind, she says. Shopping still can be a daunting task for gluten-free consumers who want to purchase non-GMO foods. Sklar usually sticks to specialty food stores. “I can walk around a normal grocery store or convenience store and not be able to buy anything,” she says. That may soon change. 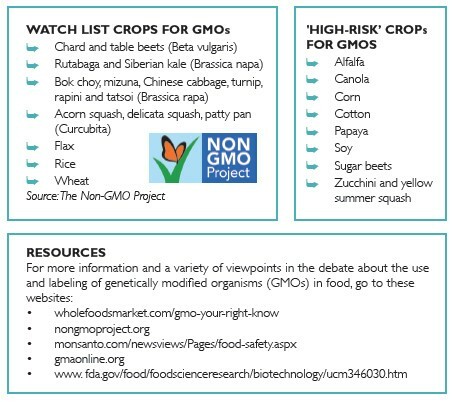 As of late 2013, there were 14,000 verified non-GMO products on the market, Kinsman says. The Non-GMO Project doesn’t specifically track gluten-free non-GMO products, she says, but the number is clearly growing. “We do have a ton of verified gluten-free brands,” she says. “We are just seeing tremendous growth in all categories, from soups and dairy products to cereals and packaged meals. And there is more good news for gluten-free consumers who want to purchase non-GMO products. In 2013, Whole Foods announced that all GMO-containing foods in its North American stores must be labeled by 2018. Whole Foods sells more than 4,800 Non-GMO Project verified products from 250 brands, more than any other retailer in North America. “Gluten-free foods cost at least twice as much and even up to six times more than gluten-containing counterparts,” Falini says. Non-GMO products will further boost food prices, since consumers must absorb at least some of the costs of the certification. Worldwide, 64 countries currently have strict regulations or complete bans on GMOs, including China, Japan, Australia and all countries in the European Union, Non-GMO Project spokeswoman Caroline Kinsman says. At press time, dozens of U.S. states were considering legislation or opening discussions on mandatory labeling of GMO products, according to Kinsman. The U.S. Food and Drug Administration allows food manufacturers to voluntarily label whether their products contain GMOs, as long as the labeling is truthful and not misleading. But like a gluten-free label on products, there is no requirement that a GMO label must be used. Foods derived from genetically engineered plants must meet the same safety and other requirements as any food, according to the FDA. In April 2013, the FDA’s website addressed consumer outcry against GMOs: “We recognize and appreciate the strong interest that many consumers may have in knowing whether a food was produced using genetic engineering. FDA supports voluntary labeling for food derived from genetic engineering. Mary Beth Schweigert is a newspaper reporter covering health, food and other lifestyle topics in Lancaster, Pa. She contributes frequently to Gluten-Free Living and last wrote about the International Celiac Disease Symposium.